The fastest growing age group of people who declare bankruptcy is seniors. How is that possible? Isn’t it true that seniors are the richest generation, benefiting from high real estate values and company pensions? In today’s podcast, Dr. Lee Anne Davies, co-author of When Life Bites You in the Wallet, discusses the financial challenges faced by seniors and gives practical advice for over-coming “Bag Lady Fears”. The average senior debtor owed $68,776 in unsecured debt, the second highest among all age groups. Senior debtor’s credit card debt was $37,161, the highest credit card debt of all age groups and 57% higher than the average debtor. Senior debtors have a high likelihood of citing illness, injury, and health related problems as a cause of their financial difficulties. Only 56% of senior debtors had RRSP savings and the average total RRSP value for those with RRSPs was only $19,464. Dr. Davies talks about how we are more likely to think we know more about debt literacy than we really do. This belief is most pronounced among the elderly and women. This makes these groups particularly vulnerable to making financial mistakes and becoming victims of financial scams and fraud. Lee Anne advised that seniors need to take extra care when handling their finances. So a real message to anybody age 65 and over, you need to have extra precautions in place when you’re making financial decisions. She also expressed a concern about the elderly’s desire to help out the younger generation, as this is placing them at increased financial risk when they can least afford it. In particular she advises against co-signing loans in favour of other options, including gifting, to avoid any further financial liability no matter what pressure is placed on you by the expectations of younger family members. So we start to get this erosion of the seniors’ money, their financial status, because the younger generation is putting pressure on them and that’s a slippery slope. Dr. Davies exposes a real life fear, known as ‘bag lady syndrome’. She describes a fear, among women, of becoming poor. Surprisingly, this fear is even held among women in higher income brackets. Increased life expectancy leads women to recognize that they may be living their senior years alone, possibly in ill health, and with little support. She expressed concern about the number of young women who still today are not taking an active role in their finances. Her advice is to take control of your finances at any age. Never abdicate responsibility to someone else, even your spouse. Make sure that you understand your money at all ages. It doesn’t mean you have to do all the work, but if does mean you have to know how it all works. If we can get people thinking about their finances, understanding it, becoming more financially literate, I believe that bag lady syndrome will start to dissipate. A few months after this show was first broadcast we released our updated Joe Debtor study, and it was the Senior Debtor that generated the most media attention. We discovered that senior debtors have the most total debt, and they also owe the most debt to credit cards, taxes, and even payday loans, a subject I address in an updated introduction and summary to this podcast. A full transcript to this podcast is available below. This show was rebroadcast as a best of season as episode 48. 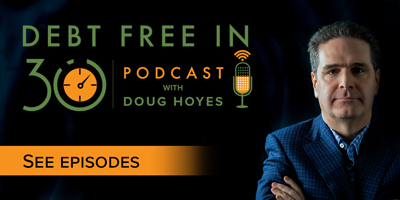 Doug Hoyes: Welcome to Debt Free in 30 where every week we take 30 minutes and talk to industry experts about debt, money and personal finance. I’m Doug Hoyes. Did you know that the fastest growing age group of people who declare bankruptcy is seniors? It’s true. Over the last few years as the economy has improved slightly, and as the rate of bankruptcy filings in the general population has dropped, only one age group has had a net increase in bankruptcy filings and that’s people over 60 years old. How can that be? Isn’t it true that seniors are the richest generation? They benefitted from rising real estate values and company pensions so shouldn’t they all be well off? Well you can’t overgeneralize. Some people are better off than others. Some seniors are well off and some are facing many challenges. 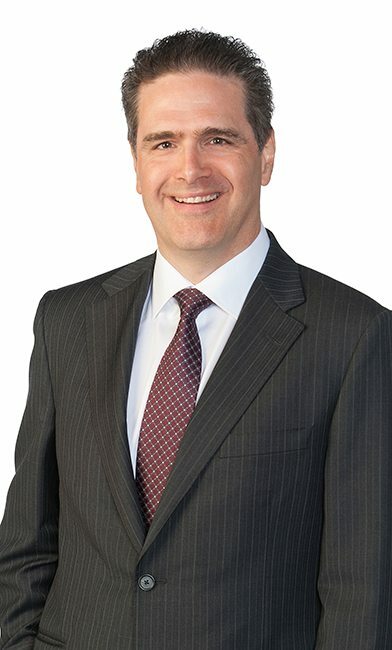 When my firm, Hoyes, Michalos & Associates, did a study of people who filed a bankruptcy or consumer proposal with us, we found that the average senior debtor owed almost $70,000 in unsecured debt, which was the second highest among all age groups. Senior debtors’ credit card debt was over $37,000, which was the highest credit card debt of all age groups and that was 57 percent higher than the average debtor. That’s a huge problem. Today, we’re going to talk about seniors, aging, and debt. I’ve got just the expert on the line to help us do that so let’s get started. I’m very pleased to welcome to the show Lee Anne Davies who may end up being the most educated person we ever have on this show. She has a master’s degree from the university of Waterloo and she also has an MBA and a PhD, as well as many years of experience working in the financial sector as an employee, consultant for insurance, wealth management, banking and financial education companies. She’s also the co-author of a new book called When Life Bites You in the Wallet -Taking Control of Your Finances. It’s an excellent book and I’ll put a link to the book in the show notes at hoyes.com if you want to get a copy. Dr. Davies, welcome to the show. How are you doing today? Lee Anne Davies: Thank you very much Doug. I’m doing very well today and I’m very pleased to be joining you on the show. Doug Hoyes: So tell me a bit about your PhD. So, what exactly is your area of expertise? Lee Anne Davies: Well what I looked at when I was doing the research for the PhD was changes in health and I looked at that across three Canadian provinces in trying to understand what changes effected people’s ability to manage their money and I looked at that for people ages 55 and over. Of course the types of things that I’m really interested in are when family structures change, so for example someone becomes widowed or when there start to become cognitive problems because the increase in Alzheimer’s and other dementia cases is becoming a big concern for the financial industry as well as many other areas in our lives. Doug Hoyes: So you’re an expert both in money and in seniors and aging. So, let’s talk about that. In your new book you talk about seniors and debt and you quote from our Joe Debtor study where we found that people over the age of 60 now account for 10 percent of all insolvency filings and they’re the only age group to experience a net increase in total insolvencies. So, why is this? What’s happening? Why are bankruptcy’s going up for seniors? The first thing that I found from some of the research, and unfortunately I still have to look at American data for a lot of this but it does translate well over to Canada. One of the research areas, when looking at financial literacy, how do seniors understand the aspect of debt, really calling it debt literacy, and what was found from the studies is that people who are older, this is age 65 and older, they seem to think they know more than they really do know and that was very pronounced in elderly and women. Doug Hoyes: So your study wasn’t able to figure out exactly why it is that seniors may not have the same level of literacy as other people. Do you have any gut feel on why that is? I mean, you gave a couple of possible explanations. Do you have a gut feel on why that is? Is it simply because they weren’t exposed to credit cards 50 years ago and therefore they didn’t grow up with them or is it something else? Lee Anne Davies: It’s definitely related to their lack of exposure and usage of credit products when they were younger but what I want to do is share with you are a few numbers that I think are fascinating and I think start to reveal more of what’s happening in Canada. Stats Canada has a terrific survey called the Survey of Financial Security and it has three points of data; 1999, 2005, and 2012. That gives us a great perspective of what’s happening as far as people’s consumption and spending patterns both. I want to look at, in this case, mortgages and the years that I’m looking at are age 55 to 64 and age 65 and over. So, come along with me with these numbers a little bit. I know it’s a bit of a pain to follow numbers when you’re just listening to them but somebody who is 65 years and older, in 1999 had a mortgage of just over $13,000. Now jump ahead to 2012. That same person who is age 65 years and older now has a mortgage of $46,000. That is about a fair bit of jump there. That’s about a three and a half point jump. When we look at somebody’s total assets, who’s 65 years and older for that same time period, their assets jumped by only about a two percentage point. So we’re seeing the debt side going up faster than their asset side and of course, that will affect your overall net worth. So what is going on here? Why do we have people who are older having mortgages that are larger than they used to be? My biggest fear in all of this is that it’s not necessarily that somebody older is going out and buying a more expensive house and having to take a mortgage. My biggest fear is that they are co-signing for their children or their grand-children and this is where we get into the idea of debt literacy and understanding the implications of co-signing for somebody. Doug Hoyes: Wow, so we’ve got problems at both ends of the age spectrum. We’re going to take a quick break. You’re listening to Debt Free in 30. My guest is Dr. Lee Anne Davies and we’ll be right back. Doug Hoyes: Welcome back to Debt Free in 30 where every week we take 30 minutes and talk to industry experts about debt, money, and personal finance. Today, my guest is Dr. Lee Anne Davies who has a new book out called When Life Bites You in the Wallet — Taking Control of Your Finances. In chapter 26 you talked about bag lady fears. So I found that phrase very interesting. What exactly does that mean? Explain that to us please. Lee Anne Davies: Hi Doug, yeah. Bag lady fears is something that is top of mind with me because I encounter it so often in conversations with women almost any place where I go. Generally the whole bag lady perspective is a stereotype. You know, we think the crazy lady or the crazy cat lady and so forth, it’s driven by someone with a mental illness when they’re at risk of poverty. The reality today is that the bag lady syndrome is something that is affecting even high net worth women. I want to give you an example of a survey that was done by Alliance Life Insurance in 2013. Almost 50 percent of US women fear being poor. I’ll take that a step further. Women in the US with incomes over $200,000, 27 percent of them fear being poor; so what is going on here? 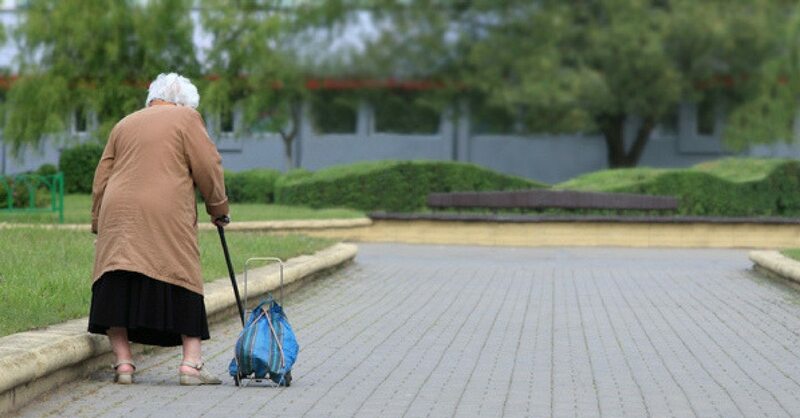 Well, basically with bag lady syndrome what we have is women recognizing their life expectancy means that they’re likely going to end up living alone, because they’re living longer, and they’re at risk of isolation. So, in Canada if we look at the life expectancy of male verses female at birth, it’s 79 for a male and 83 for a female. If we look at life expectancy when you’re at age 65; a male is 83 and a female is almost 87. Now I go to adjust life expectancy for health, and what that means is how long you are healthy before you start to become dependent on needing some sort of assistance or levels of medication. Now here’s the big one. For males in Canada it is age 70 and for females it’s age 71. Notice how they almost are identical? What that means is that we’re going to have women living longer but they’re also not going to be as healthy and that makes them vulnerable. So that also adds to the concerns about becoming a bag lady because you’re going to need more help. So you’re going to live longer and you’re likely going to be experiencing some level of illness. Now the next problem that we’re running into with this bag lady syndrome is why are we getting these women who have money being concerned about being poor? Well, they grew up with mothers and grandmothers who were economically dependent. I think, this is just my theory and there’s no research to prove this, but I think that role models have such an influence on the way we perceive ourselves that the generation of women who are in their 50’s and 60’s now, still have that sense that they could become economically dependent themselves. It increases their vulnerability. I believe that the next generation, so basically our daughters, are not going to have that same sense; that same feeling of the bag lady syndrome to some degree. I’m going to put a little provisal in this one. I am very concerned when I see young women not really taking control of their finances and we’re still seeing that issue. Women need to understand money at all ages. So I have great hope that the next generation won’t have the bag lady syndrome fears but I do have a little bit of concern that they’re still not stepping up to the plate on that one. The other thing, the fourth aspect of bag lady syndrome is anecdotally what I continually get as feedback from the women I speak to is that their spouses or brothers or whoever is the key male in their family who is looking after some financial matter will turn to them and say – “Don’t worry, I’ve got it under control”. When you hear that sentence, you need to stop and say look, I’m so pleased that you’ve got it under control. I really appreciate the effort that you’re taking but I need to understand it too. I need to understand it should anything ever happen to you and I need to step in but I need to understand it for my own piece of mind. Never let somebody look after something that is your own responsibility. Do not abdicate the responsibility for your finances. If we can get people thinking about their finances, understanding it, becoming more financially literate, I believe that bag lady syndrome will start to dissipate. Doug Hoyes: So you’re saying it’s a real fear. It’s not an irrational fear. The health concerns, income concerns and so on, but the solution ultimately, if I am a female who is worried about that, is literally to take control of my own finances to understand what’s going on. That’s the practical takeaway message? Doug Hoyes: Excellent. Well that is very practical advice. I really appreciate that. Thank you very much for joining me today Dr. Davies. I really appreciate it. Lee Anne Davies: My pleasure. Thank you. Doug Hoyes: Great, thank you Dr. Davies. We’ll be right back with our closing segment. This is Debt Free in 30. I’m Doug Hoyes and it’s time for the 30 second recap of what we discussed today. My guest was Dr. Lee Anne Davies and we talked about how seniors have the highest level of credit card debt of any age group that goes bankrupt. That’s scary. We also talked about bag lady syndrome. The fear that as you grow older, you’ll be left with limited financial resources. Half of women worry about being poor and even a quarter of high net worth women, that’s women with a family income of $200,000 or more a year, also fear being poor as they get older. Dr. Davies is very concerned we don’t understand money as well as we think we do and it’s our responsibility to take responsibility for our financial future. That’s the 30 second recap of today’s Debt Free in 30 show. So, what’s my take on all of this? Well, there is no doubt that those numbers are startling. At age 65 the average life expectancy is 83 for men as compared to 87 for women. So women have a longer life expectancy than men which means mathematically they are more likely to spend a portion of their later years alone. That can really strain the finances if you lose one of your families incomes. If your spouse has a pension or other income but it is no longer there, your family income is likely to drop. That’s a problem if you’re going to outlive your spouse. The other problem is that as we get older we have increasing medical expenses. Our health begins to decline so not only does your income potentially decline as you get older but you could have higher medical expenses for prescriptions or other things to deal with medical conditions. It’s a double whammy. That’s why it’s critically important that you’ve got a handle on your finances as you get older. I thought it was interesting that Lee Anne said one of the things that worries her is when she hears a woman tell her that well, my spouse said “Don’t worry, I’ve got all the finances under control. You don’t have to worry about it.” Dr. Davies’ comment to that was your response should be hey, that’s great that you’re looking out for me, but I need to understand it as well and I fully agree. Over the years I have counselled lots and lots of people who have lost a spouse and they are left adrift. They have no idea what’s happening with their money. In some cases they can’t even get into the bank account because they don’t know the password for their web banking. They don’t know where the investments are, where the RSP’s are, where the insurance documents are, they don’t know where the mortgage documents are. It’s a serious problem. You’ve got to know how everything works because someday you may be the person looking after it. Never let someone else look after something that’s your responsibility. It doesn’t mean that you have to take over everything, but you should know how everything works. That’s the message from today’s show. That is it for our show today. I want to thank Dr. Lee Anne Davies for joining me today to talk about debt and seniors. I fully agree with her statement that it’s up to each of us to take responsibility for our financial well-being. I think becoming educated about your money is the first step. That’s why we do this show. If you’re listening to this on the radio, thanks for listening. Please make a note of the station and time this show is on so that you can tune in again next week. If you’re listening to this in podcast format, fantastic. Please subscribe on iTunes or whatever other podcast service you use so that you can get the show every week. This is show number two so for information on today’s show you can go to hoyes.com to see the show notes and we encourage you to leave your comments right there on the website or to get the show notes for any of our shows, you can go to hoyes.com. That’s h-o-y-e-s-dot-com, click on the blog, go to the podcast link, just search for the word podcast. You can read our show notes, get links to everything we discussed, and you can even listen to the show again on your computer. That’s hoyes.com, h-o-y-e-s.com for full show notes. Until next week, I’m Doug Hoyes. This was Debt Free in 30.